Classy but chic, versatile but sturdy- it’s no wonder mason jars have exploded in popularity, finding their places as drinking jars in cafes, as spice jars in restaurants, as decor for festivities, as gifts for weddings, and inside every trendy household kitchen. Perhaps not even its inventor, a Philadelphia tinsmith named John Landis Mason, could have foreseen the ubiquity of his simple creation a whopping 160 years later. The small elegant mason jar is sure to be a timeless trend perfect for every occasion, or even no occasion. 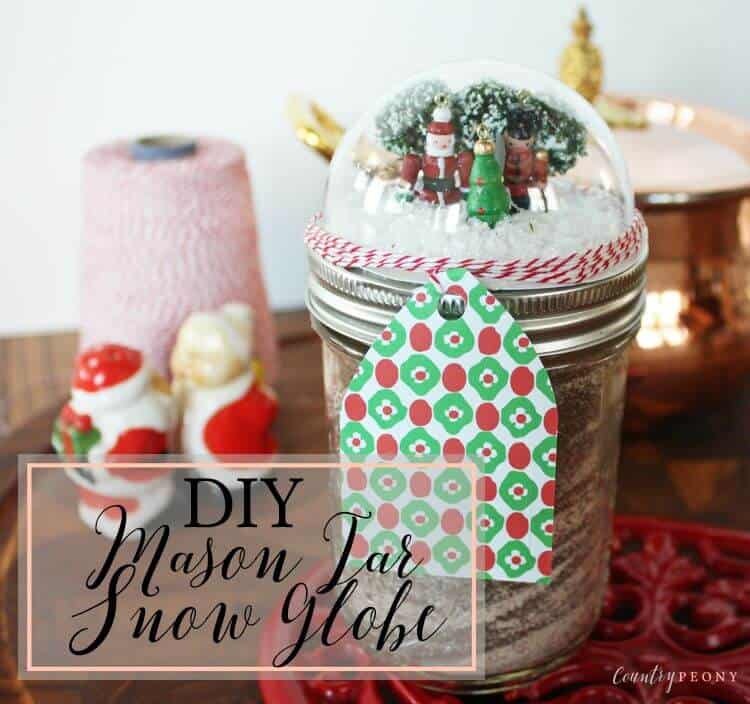 So this snowy season, let us take you through a journey of the best mason jar craft ideas to spruce up your home and make even the simplest Christmas gift Pinterest-worthy. Sticking to the classics is one of the best ways to showcase your home decorating skills because it won’t get out of style. Neutrals and earth tones will transform your home into chic natural. You may also want to add rustic pieces around your house to get that woodsy vibe. Good news is going natural doesn’t have to be expensive at all. Mason jars make perfect table centerpieces. 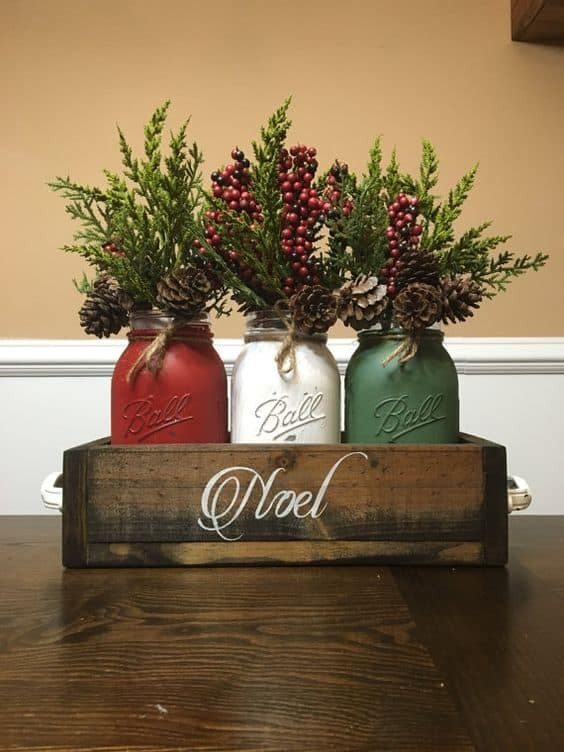 To make a rustic-inspired centerpiece using old Ball mason jars, first, you need to spray paint the jars in Christmas colors — green, white, and red — then let them dry. Next, wrap twine around the neck of jars and tie them. Transforming the mason jars into Christmas planters, you can now place holly and acorns to make them look festive. Place the jars in a Christmas-themed wooden box to complete a beautiful rustic centerpiece. Gift jars had always been a hit, especially if they look really attractive. For Christmas, you can give food jars to your friends and family. 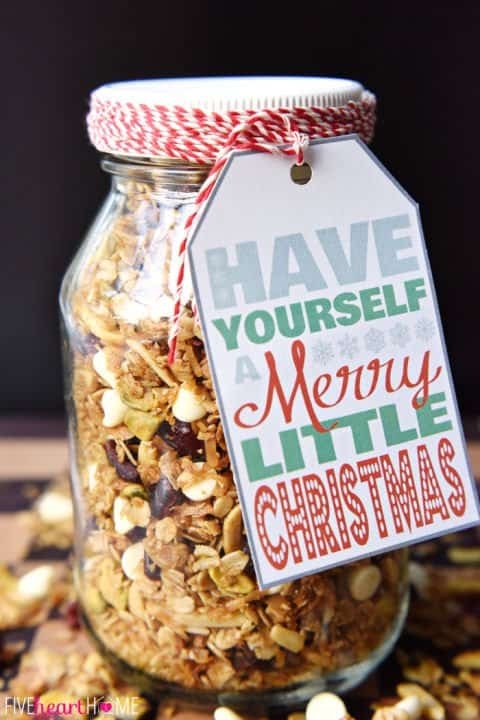 And since the gifts should stick to the holiday theme, you can make your own gingerbread granola mix that they can merrily snack on during the festivities. This is gingerbread granola with dried cranberries, pistachios, and white chocolate chips. Just mix them all up then finish with a gift tag and you’re done! 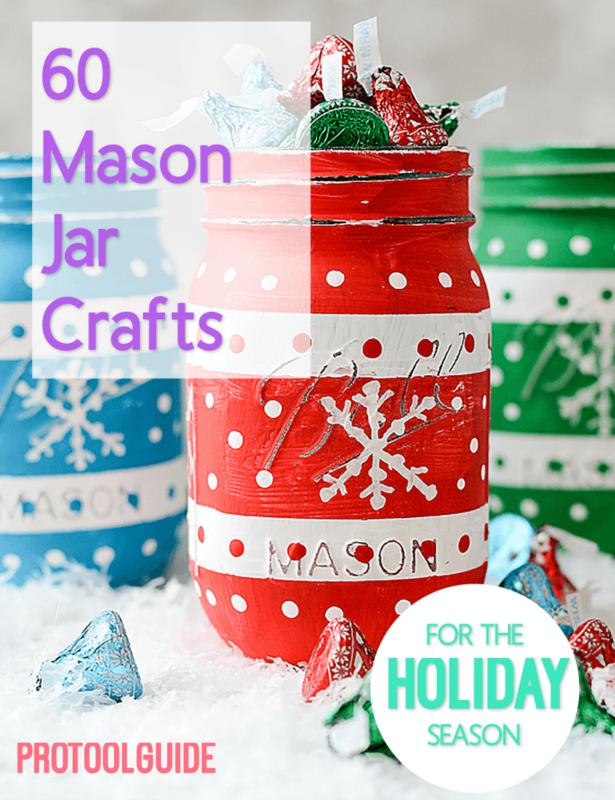 You’ve got yourself a super easy and hassle-free mason jar craft project. This candle holder will remind you of a white, snowy Christmas. 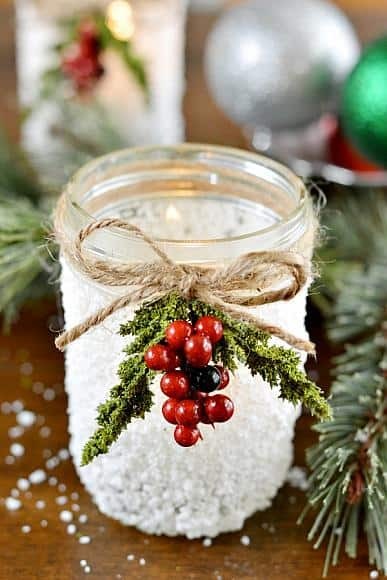 All you need is a mason jar, decoupage glue, Epsom salt, twine, holly decor, and a candle. First, you need to cover the outer part of the mason jar with decoupage glue (you may also use Mod Podge). Next, cover the jar with Epsom salt. Salt falling off the jar is a cool faux-snow effect, but if you don’t want salt falling off from the jar, apply another coat of decoupage on top of the dried salt or use a spray sealer. To finish it off, decorate with twine and holly, or any other Christmas deco that’s available in your craft stash. The snowy candle holder looks better when the candle is lit. 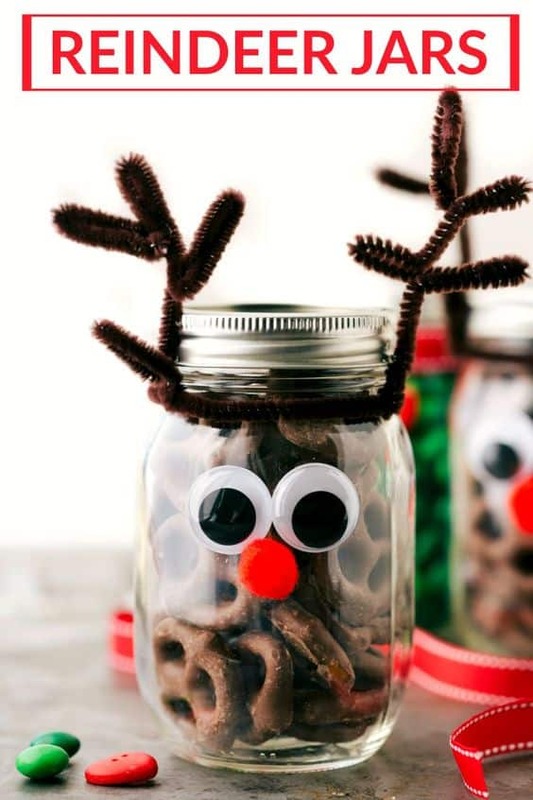 A reindeer jar is best for keeping kids entertained during Christmas parties. It’s fun to prepare and it will only need a few materials: brown pipe cleaners, a pair of googly eyes, red pom poms, glue, and chocolate pretzels. 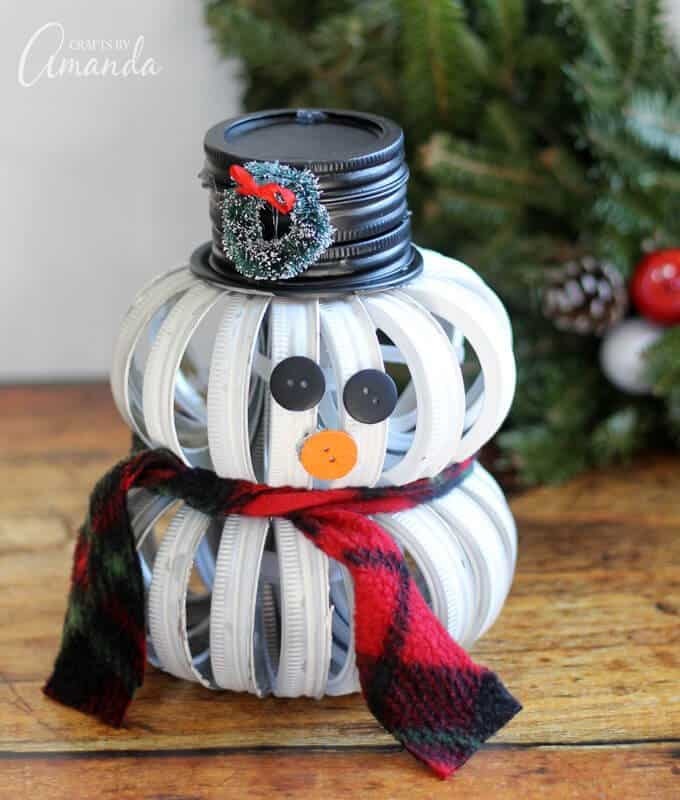 Twist the pipe cleaners to form reindeer antlers and secure around the jar neck. Glue the googly eyes and the pom pom, then fill the mason jar with choco pretzels. You may also use malted choco balls or brown M&M’s. This Rudolph reindeer will also make a cute Christmas present for the kids in your neighborhood. 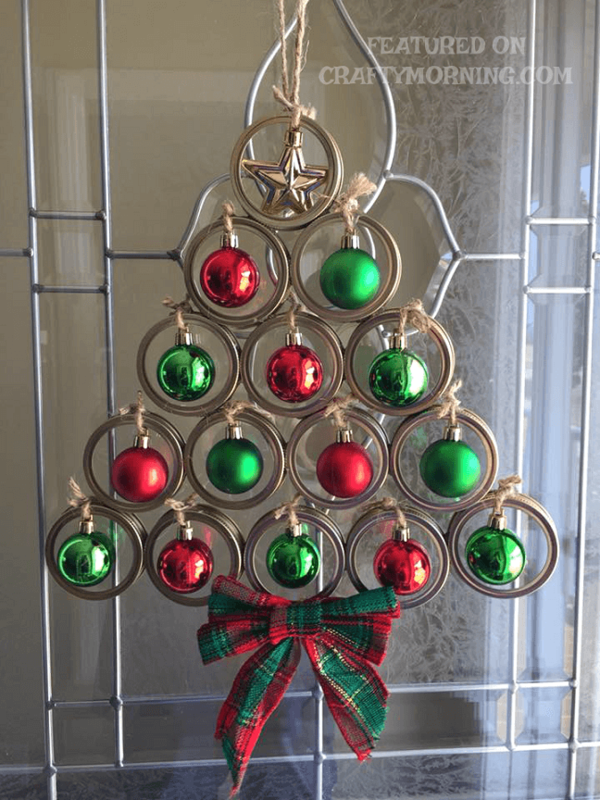 Is it time to change your Christmas tree ornaments? Why not veer away from the usual Christmas balls and try these mini wreaths to spice things up? These mini Christmas wreaths are made out of mason jar lid rings. It might look complicated at first but it’s really so simple to do. So if you have some spare mason jar lids that you’re not going to use, you can still prettify them and have them on display. You can start by cutting a piece of hemp twine and looping it through your lid ring. Tie the two ends to make a knot. Now that you’ve made the string to hang it up, glue the end piece of pine garland and wrap it all the way around the lid ring. Secure with hot glue at the end when the whole ring is fully covered. For the final touches, you may use buttons and glue them onto the pine garland. It’s recommended that you use buttons of different sizes and colors for variety. This is by far one of the best homemade gifts that your friends will surely like to receive this Christmas. 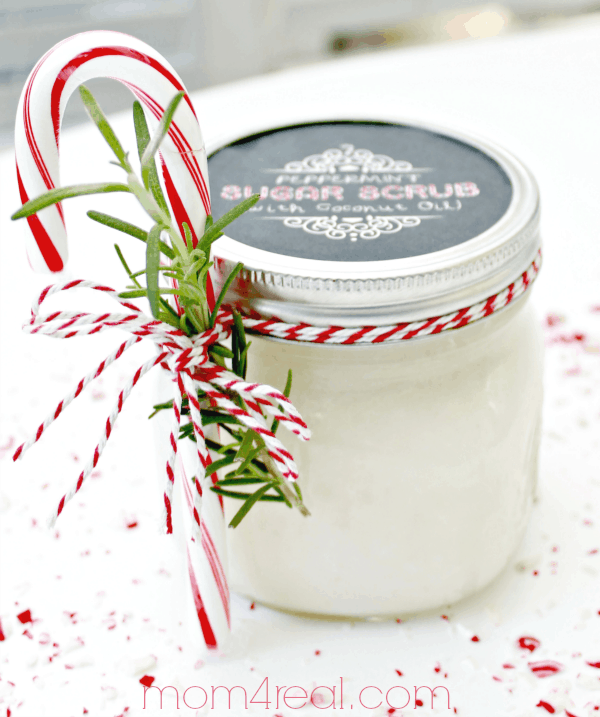 What’s not to love in peppermint sugar scrubs? 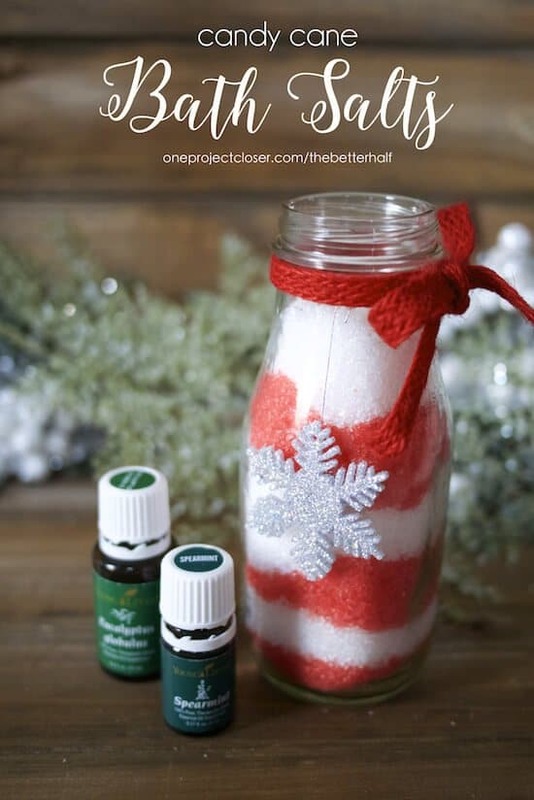 You will need a wide mouth, a pint-sized mason jar (preferably Ball), 1 cup of sugar, 1/4 cup of coconut oil, and 15 drops of peppermint essential oil. Mix all the ingredients with a spoon in a large bowl then place it in a mason jar. Finish off with a candy cane and a rosemary sprig. Perfect for spa time! Christmas season is the best time to bond with your family and share your blessings with friends and strangers. Whether it be sharing a craft activity together with your loved ones, watching a Christmas musical with colleagues, or starting a charity drive with your neighbours to support a cause and give back to the communities, Christmas time always gives us enough reasons to be more productive, more generous, and closer to God. This is a super-easy craft that both glows and sparkles, in the fun colors of the iconic Christmas candy–the peppermint cane. You can make it in less than 5 minutes and with less than 5 dollars– all you need is tape, Mod Podge, glitter, and of course some fairy lights or candles to make it shine. Add some twine and candy cane, and you’re good to go. Do you want to build a snowman? If your answer is “Yes” or “Yes but please do not start singing that song from Frozen”, consider this cutesy craft that will never melt, come rain or shine. It’s the perfect knick-knack for any part of your house, and it gets rid of the many jar lid bands that mason jar enthusiasts may have just lying around. What you need is lots of mason jar lid bands, a few buttons and mason jar lids, lots of hot glue, some spray paint, and a little patience. With winter comes the dry season, and all its curses– chapped lips, flaky skin, obvious wrinkles, the list goes on. 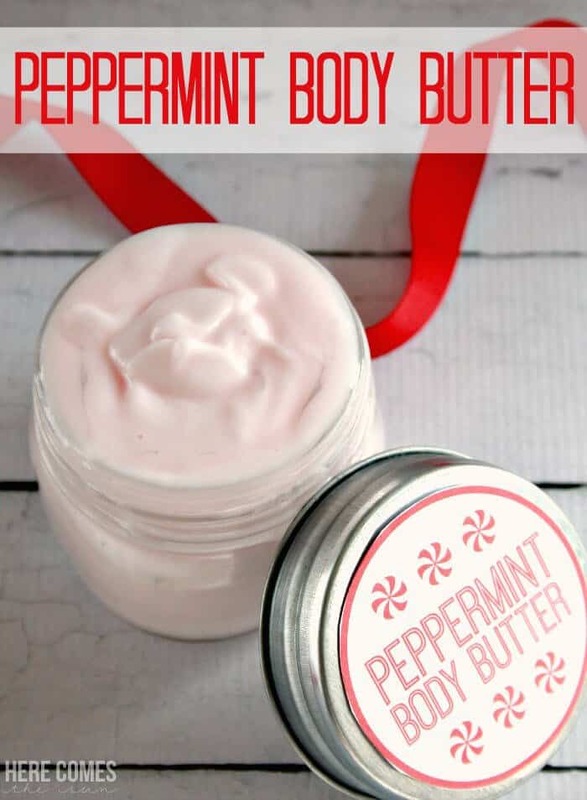 But this simple three-ingredient body butter will leave your skin both silky smooth and smelling of Christmas. Whip up vegetable shortening and coconut oil, then add a few drops of pink coloring. Give it a peppermint scent by adding a few drops of peppermint oil or a teaspoon of peppermint extract. Pack it all in a mason jar and you got yourself a perfect holiday gift. Who ever said size matters? 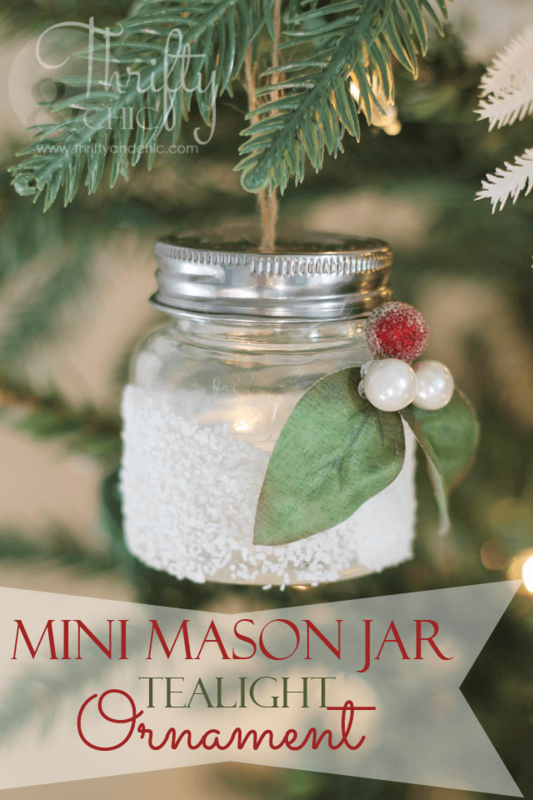 Miniature Mason Jars can fit less, but they’re a perfect fit for decorating your christmas tree as ornaments. 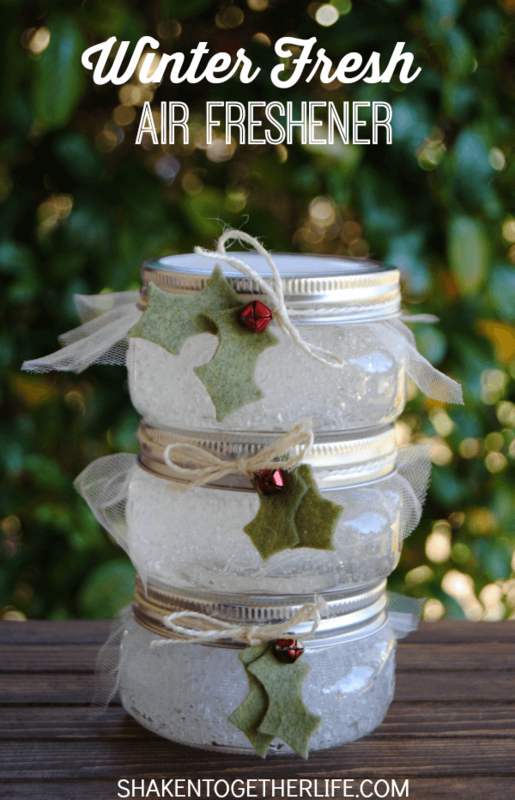 To get that snow-dipped effect, brush some glue onto a portion of the jar and roll that portion in salt. Poke a hole in the lid and string it up onto your tree with something like jute or twine, you can also hot glue the thread onto the bottom of the lid for extra hold. Place a tea light in it to make it glow, and add some christmas decor to the jar to spruce it up. Get storage-savvy with this craft, which makes use of both spare jar lid bands and spare ornaments. If your real Christmas tree is already fully decked-out, this is the perfect home for excess baubles. Hot glue your lid bands together into the shape of a Christmas tree, then tie your baubles to the bands with twine, making sure to use a dab of hot glue if you need extra hold. Add a star ornament instead of a bauble for the top, tie a bow at the bottom, and hang your ‘tree’ up with twine to get a creative door hanger. Getting the materials for this might need a little hunting in your craft store, but putting it together is incredibly easy, and the end result is well worth it. 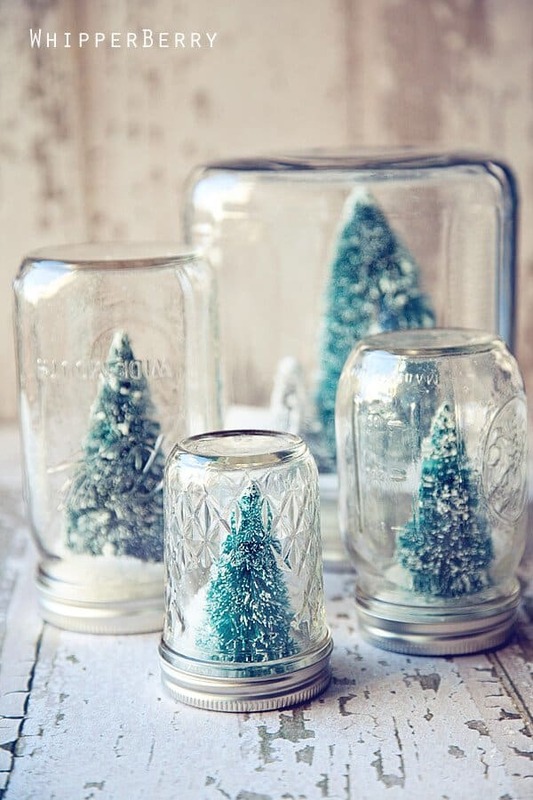 Glue a small bottle brush tree to the bottom of a jar lid, and add some faux snow into the jar. Screw the lid back on carefully, then shake to make it snow. Tiny snow-tipped trees are quite the sight indeed. This small kit is both prep for kisses and prep for winter, so let it do double duty as a date gift and a holiday gift. Besides, there’s nothing more satisfying in winter than a round of skiing or ice skating, followed by a nice warm cup of hot cocoa. Stick to a color scheme of red, white and a touch of ice blue to keep it Christmassy. You may add red gloves, hot cocoa mix, lip balm and some nicely wrapped chocolates into the jar. For how to make the miniature ice skates out of felt, yarn and paper clips, and then tie it to the jar, click below. This idea opens up a whole new world of possibilities. Is your mason jar already fully decked out in decorations? Add a transparent dome to the top of the lid and you can fill that space with anything you want. But with Santa Claus coming on his way, why not make that space a Winter Wonderland? 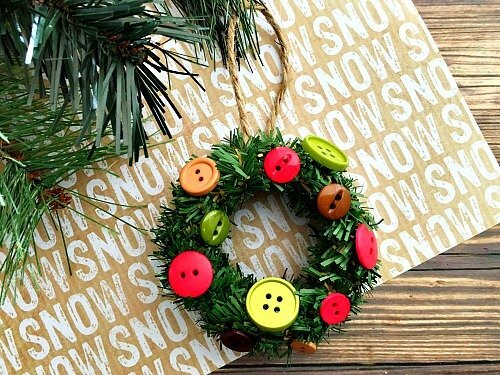 Just hot glue a circle of white cardstock to the lid, hot glue your ornaments onto the cardstock, let it dry, and sprinkle on faux snow to your heart’s desire. Hot glue the plastic dome (which can be half a clear ornament ball) onto the outer edges, and you got yourself a miniature Christmas scene. If you’ve never heard of beer bread, you’re in for a treat. It’s sweet, chewy, and has a whiff of your favorite beer, but without most of the alcohol, so what’s there not to like about it? If you make your own mix, it is frighteningly easy to accomplish and much cheaper than the commercial kits. 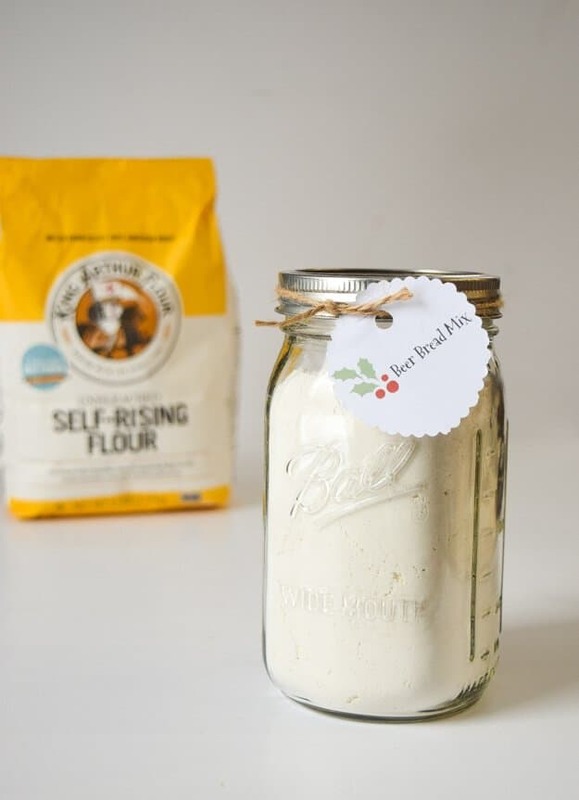 Whisk together 3 cups of self-rising flour, 1 tablespoon sugar and ½ teaspoon of salt, and put that in a mason jar. Gift it with a can of your recipient’s favorite beer on the side, and you’ve got a great gift for even non-drinkers. Muffins have always been the perfect treat for kids. But there’s no need to get up in the wee hours to bake large batches of muffins and worry about any going stale, if you simply gift a dry muffin mix in a mason jar. Make that muffin mix Cinnamon Spice for extra Christmas cheer. You will need flour, sugar, brown sugar, baking powder, baking soda, ground spices and salt (for exact measurements and instructions, click below). Stack some baking cups onto the lid and tie it down with twine if you want to be extra helpful. Twinkling bottles of ‘fireflies’ will be sure to dazzle your guests, and all it takes is a moment’s setup. 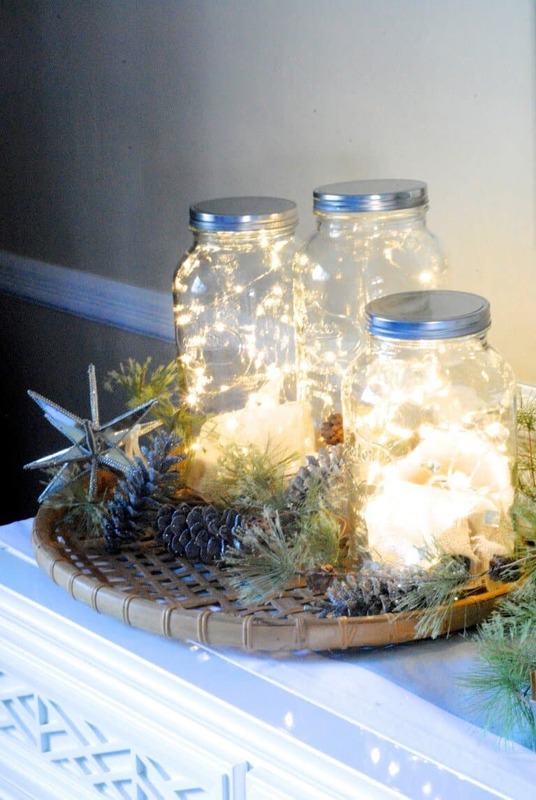 Place some LED fairy lights in a mason jar, taping the end of the lights’ string to the bottom of the lid, then carefully place the battery box at the bottom of the jar, hiding the battery with a layer of cloth. Place some ornaments and pinecones around the jars, and you’ve got quite the accessory for your fireplace mantel. Give your house (or really, anyone else’s) that cozy warm atmosphere of holiday festivities by putting on some potpourri to perfume the room. This gift is a mix of spices and dried fruits, so you can either get those off the shelf or use a food dehydrator on fresh fruits. 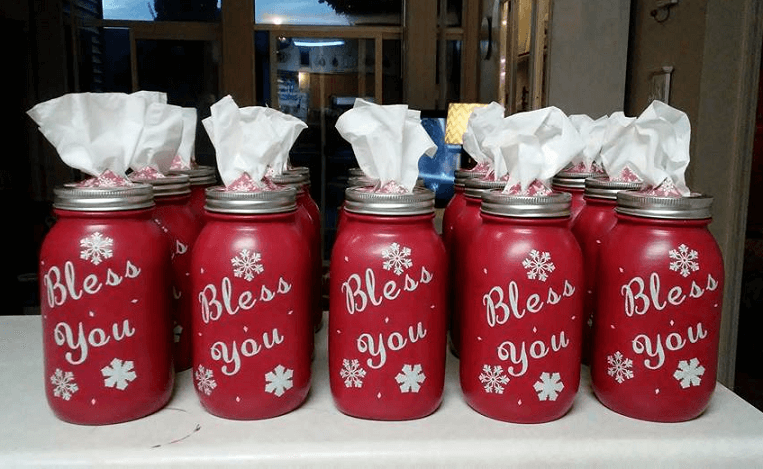 Put it all in a mason jar, slap on some instructions, and tie a coffee filter to the lid, to gift the very scent of Christmas to anyone you wish. This vintage luminary would fit right in with lovers of Christmas carols. 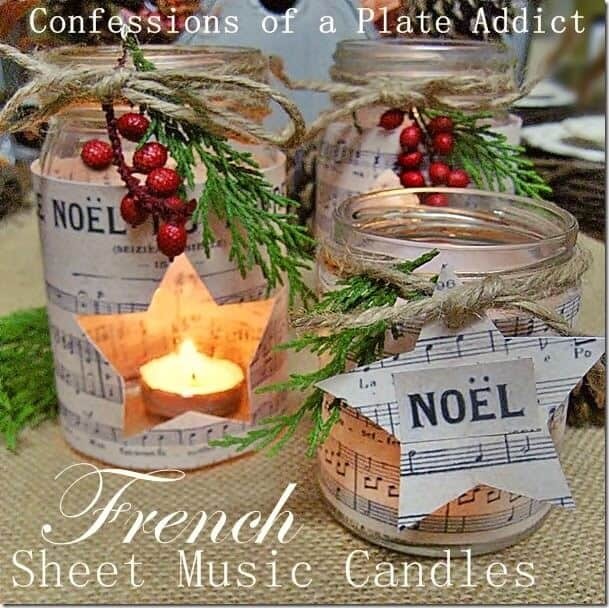 Cut up and glue together a copy of your favorite sheet music so that it appears printed on both sides, fits your mason jar, and has a cutout in the shape of a star or Christmas tree. Then wrap it around a jar, securing it with tape. Wind some twine around the jar, add some decor, and place a tealight inside the jar. My suggestion is that you dim your house lights, and put the song on (maybe using a music box), to get the ultimate Christmas musical experience right in your home. They call it the holiday season for a reason. Not all of us commemorate Christmas, and it can be hard to find crafts for other year-end celebrations. But difficult doesn’t mean impossible– this homemade menorah is made from unique mason jars with raised parts. 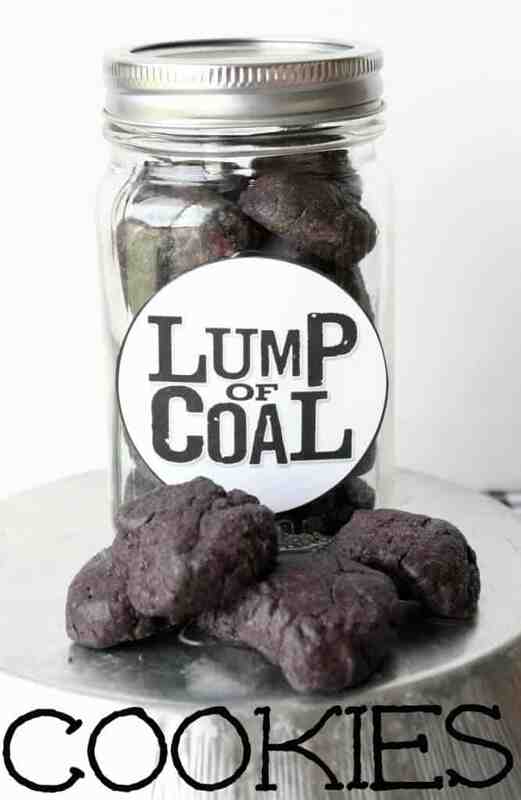 These jars are then painted with shades of Chalky Finish Paint, and have wax candles rubbed over the raised portions. 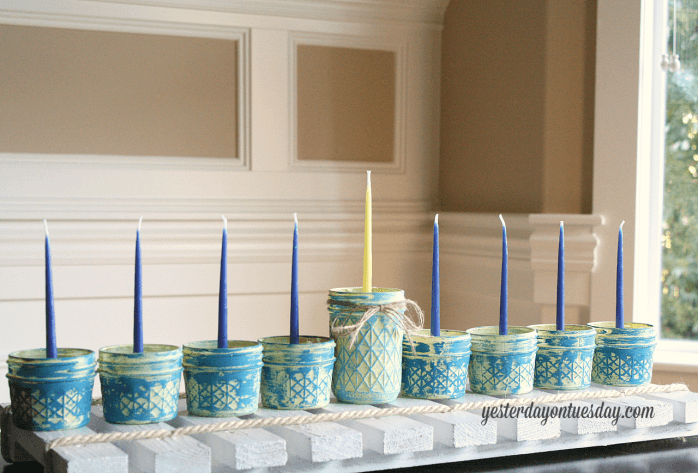 Place some salt in the jars to keep your candles upright, insert the candles, and you’ve got a menorah with a distressed aesthetic that would fit right in with rustic decor. 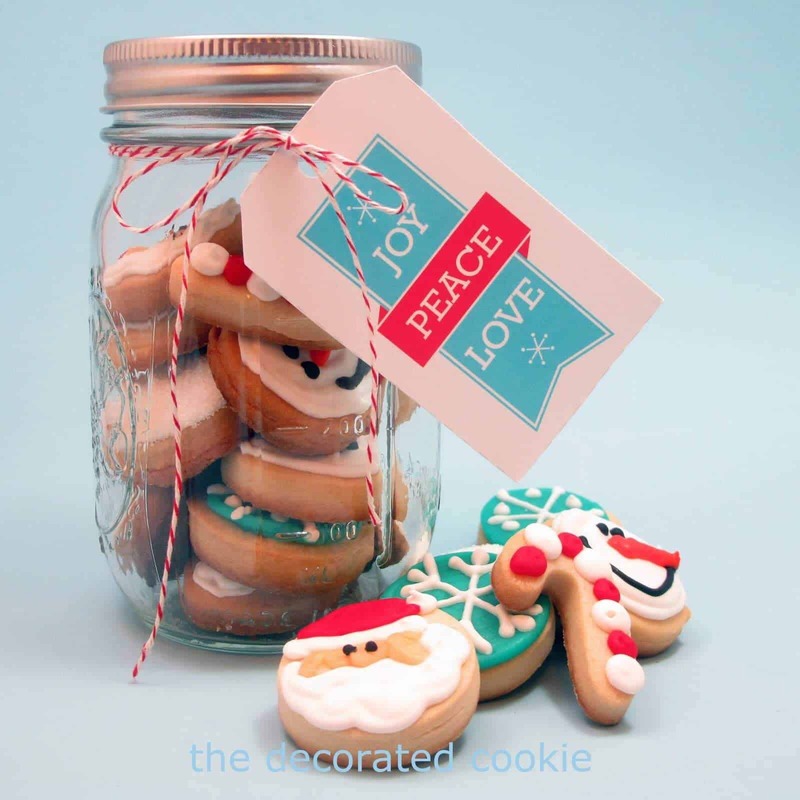 Let’s face it– if you are going gift delicious, homemade cookies in a cutesy mason jar, to someone in your life, they’re probably not that naughty after all. This playful gift is simple, but it’s sure to stand out. Use any cookie dough recipe you wish, just add black food coloring, and shape the dough by hand into lumpier square-ish shapes. Click below for a free printable and a sugar cookie recipe. With the coconut craze in full swing, your household may be stocked with all sorts of coconut products. This is a surprising spot to get rid of any spare coconut flakes, but it sure makes for some cutesy snowmen that positively glow. 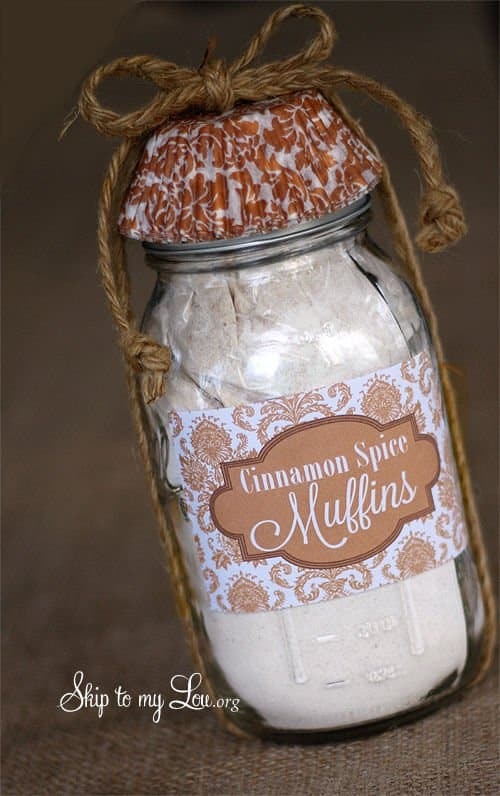 Spray paint the jar lid black, coat the jar in decoupage, then sprinkle coconut flakes all over it. Add buttons and cardstock to build your snowman, and even give him a comfy mini-scarf made from spare cloth. Fill the bottom of the jar with whatever you have on hand, then add your tealight. We all know the struggles of a freshly cut tree– it’s hard to lug around, it won’t stay fresh, and sometimes people just don’t like the smell. But this craft is a true ‘evergreen’. Not only does it always stay the same, you can take it apart and reuse the jars once Christmas is over. 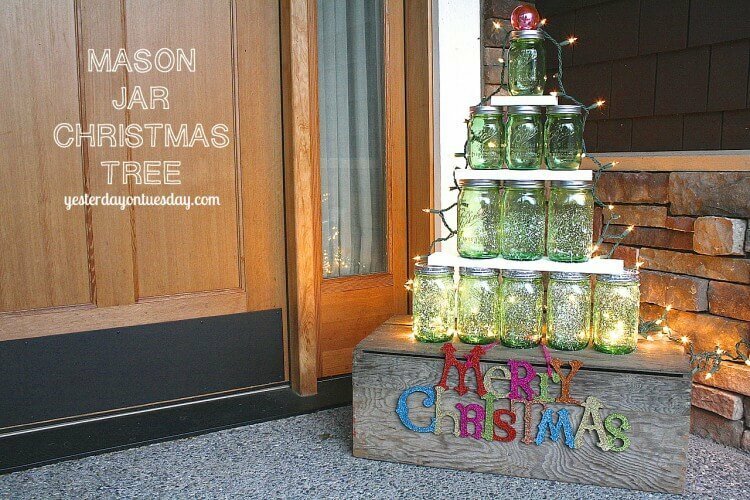 Spray paint faux snow onto green mason jars of varying sizes, get some white wood planks of varying lengths, then stack it all together into a Christmas tree. String some lights around it and shape that to accentuate the outline. Voila, a reusable Christmas tree that goes green. This project requires just three ingredients, takes less than 30 minutes, and mainly uses a microwave, so feel free to jump right in even if you’re a baking beginner. Just melt some white candy melts in the microwave, then mix in a little peppermint extract. Pour the mixture out evenly onto a baking sheet, and add a dash of red peppermint bits to really make those Christmas colors pop. Place that into the fridge to set for 10-15 minutes, break up the bark and gift it in mason jars. For detailed measurements, click below. Peppermint, cinnamon and gingerbread may be the main flavours of Christmas, but no one ever said you couldn’t break the mould. The warm, spicy notes we associate with festive flavours may put off younger kids, but caramel corn is sure to be a hit. 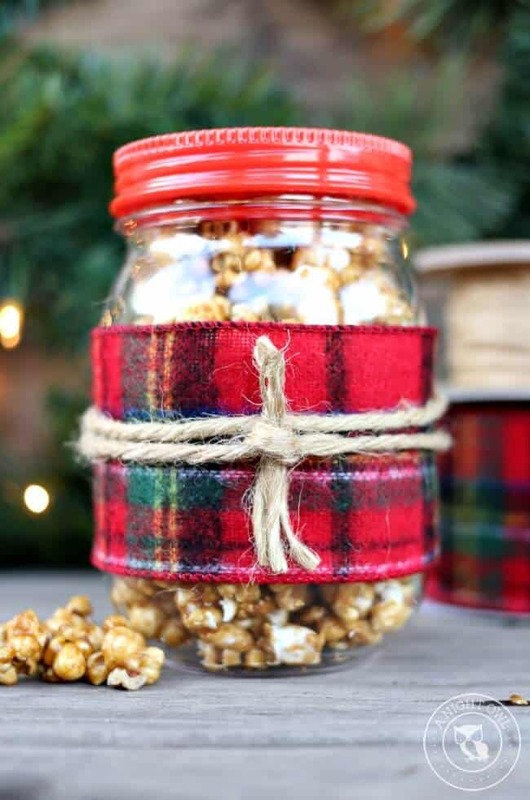 Spray paint your mason jar lid red, then pack some caramel corn into the jar. 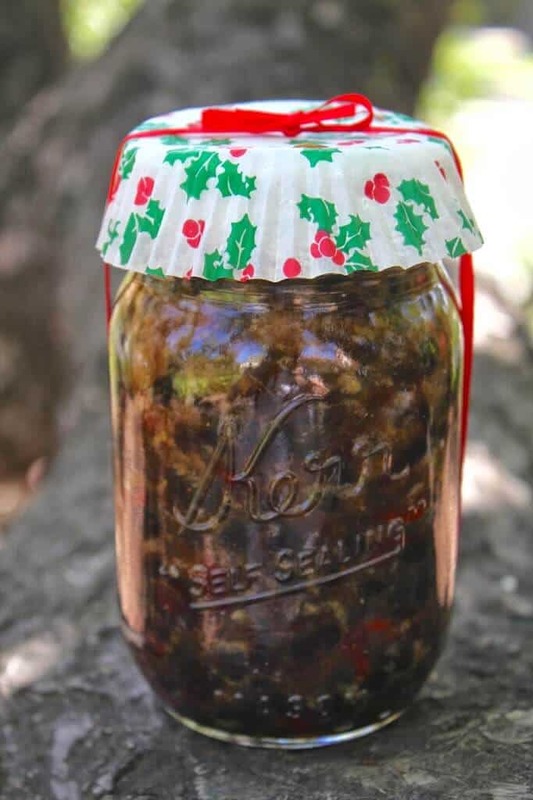 Wrap a strip of red-and-green plaid around the jar to give it those Christmas colors, and tie down that strip with twine for a rustic touch. You can’t get any more classical and vintage than with an oil candle lamp. Oil candles both illuminate and perfume your room, so it’s like a tea light and potpourri in one. Place botanicals into your jar, add a touch of essential oils for a warm and fruity scent, and fill the remaining space with olive oil. Place a floating wick at the top, light it, and add water whenever the oil level gets too low. It’s super easy, so why not make a whole ring of lamps to light up your sitting room? Layered cupcakes are always a fun-looking treat, so make them in red and white for this Christmas. Bake some cupcakes and be sure to add red food coloring. 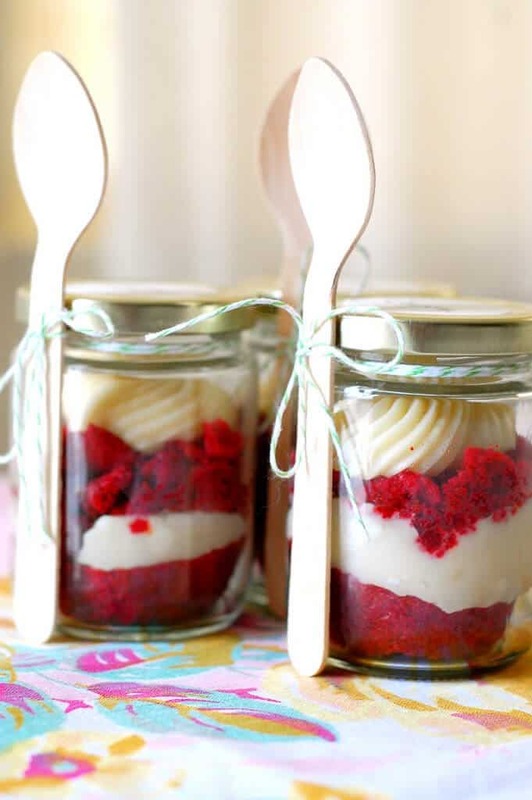 Halve your cupcakes, place a bottom half of a cupcake into your jar, add some cream cheese frosting, stack on the top half, and add more cream cheese frosting, repeating until you fill the jar. My tip is that you leave a little space to drizzle on white chocolate sauce, maybe even give it a dash of green M&Ms or crushed biscuits. These “bless you” tissue paper holders are just the project for when the weather gets cold. You’re bound to stock up on tissue paper anyway, so why not give it some festive charm and wish your guests well too? You’ll need a Cricut for this, to cut the vinyl, but there’s plenty of other beautiful crafts that use that machine, so it’s a worthy investment. Elsewise, you can get external services to cut the vinyl for you, or you may use white paint instead. You will also need an exacto knife, decoupage, scrapbook paper, and red paint. The taste of chocolatey Irish Cream has always been delightful. You’ll have to keep this out of reach of the kids, but it’s a perfect treat for moms who need to wind down at the end of the day. 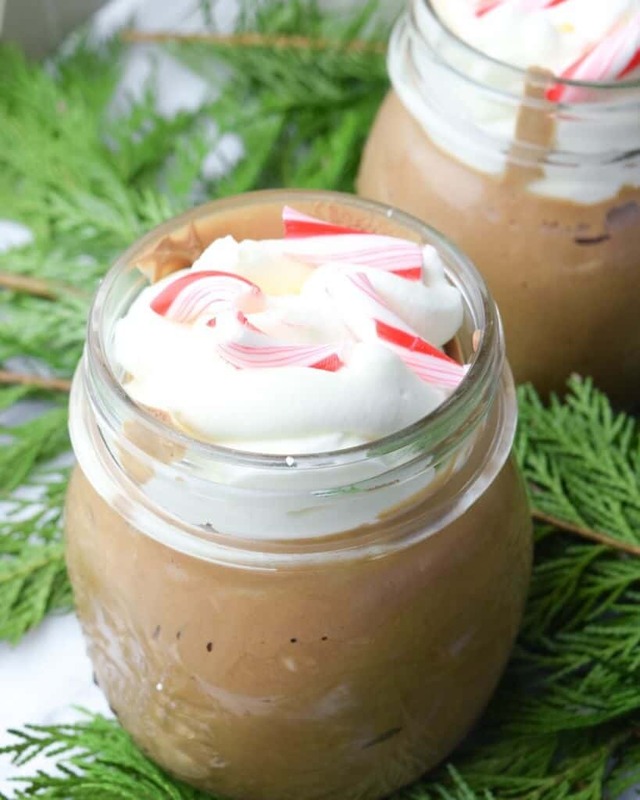 Simply layer on hot cocoa mix, marshmallows, and sprinkles, into a mason jar. Tie a tiny bottle of Baileys to the jar with twine, together with a tag of instructions on making Baileys Hot Cocoa. I recommend you gift Baileys Orange Truffle to make it fruity and festive, or Baileys Chocolate Luxe to really make your cocoa rich and indulgent. Decorating cookies is always a fun and relaxing task– you get your kids to join in too! This project gives the icing a Christmas spin, so give it a go this season. This requires you to have a range of cookie decorating supplies, including decorating tips, but the cutesy end result is absolutely worth it. You’ll also need sugar cookies, royal icing and food coloring. Put your decorated cookies in a mason jar for easy gifting, and wrap it together by tying a bow using candy-cane-colored string around the jar. One great thing about a tea kit is how versatile it is, as a gift for any occasion. 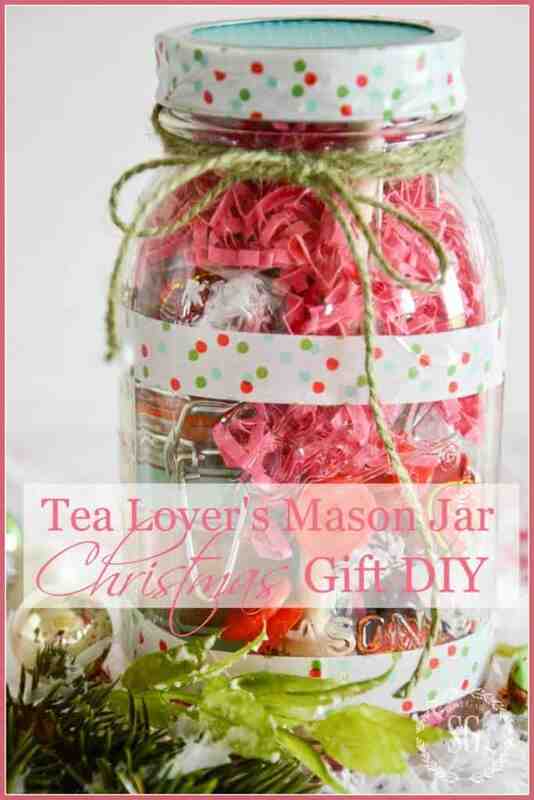 So pack a mason jar full of tea and tea accessories, in Christmas colours, for the tea lover in your life. Do check with your giftee if they like tea bags– some people drink only loose leaf tea, but you can easily get a small paper bag of loose leaf from your local tea shop. You may also include, in your gift jar, the following items: tea infuser, honey dipper, tea bag squeezer, and even fruity biscotti if you wrap it up. It’s hard to think of hot cocoa as refreshing, but peppermint hot cocoa is just the right balance between cool and chocolatey. 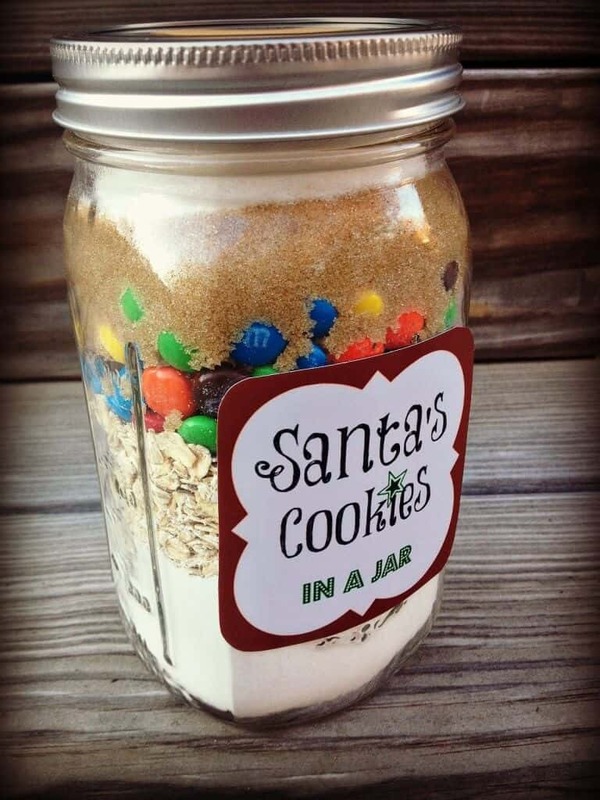 You’ll need to layer on powdered milk, unsweetened cocoa powder (I personally recommend Hershey’s), sugar, a pinch of salt, chocolate chips, and crushed peppermint candy, all into a mason jar. 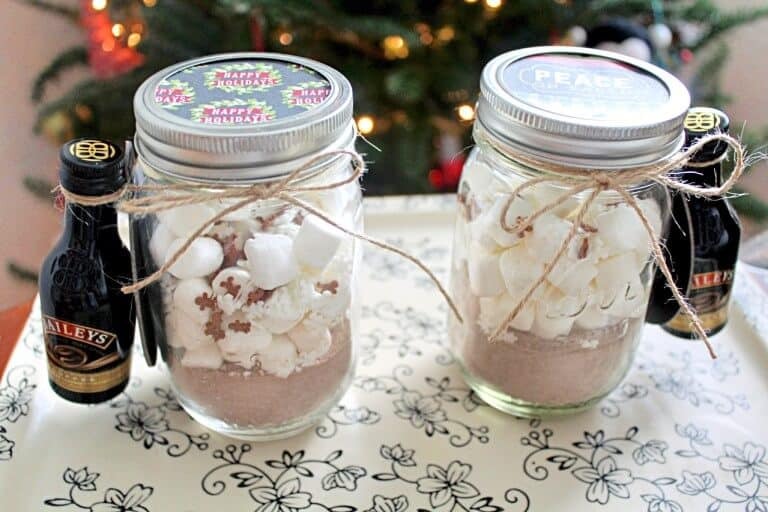 Fill up the remaining space with mini marshmallows, to give it that packed look. 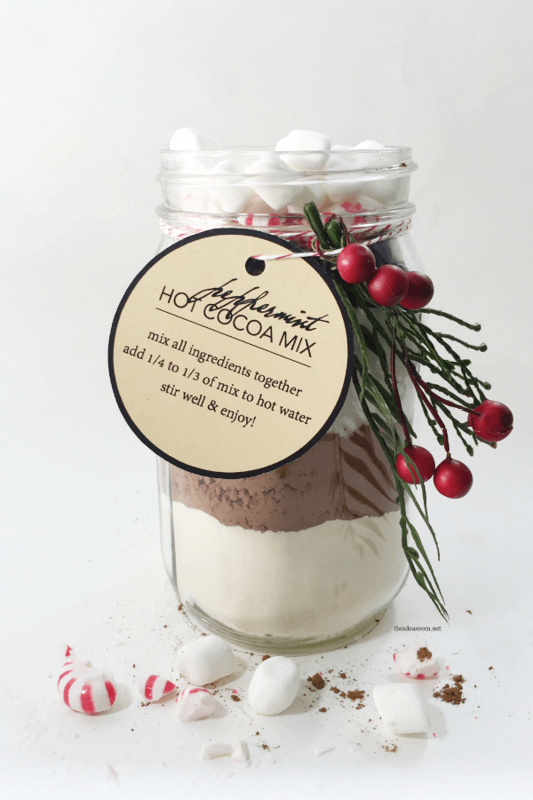 Voila, a giftable peppermint hot cocoa mix. 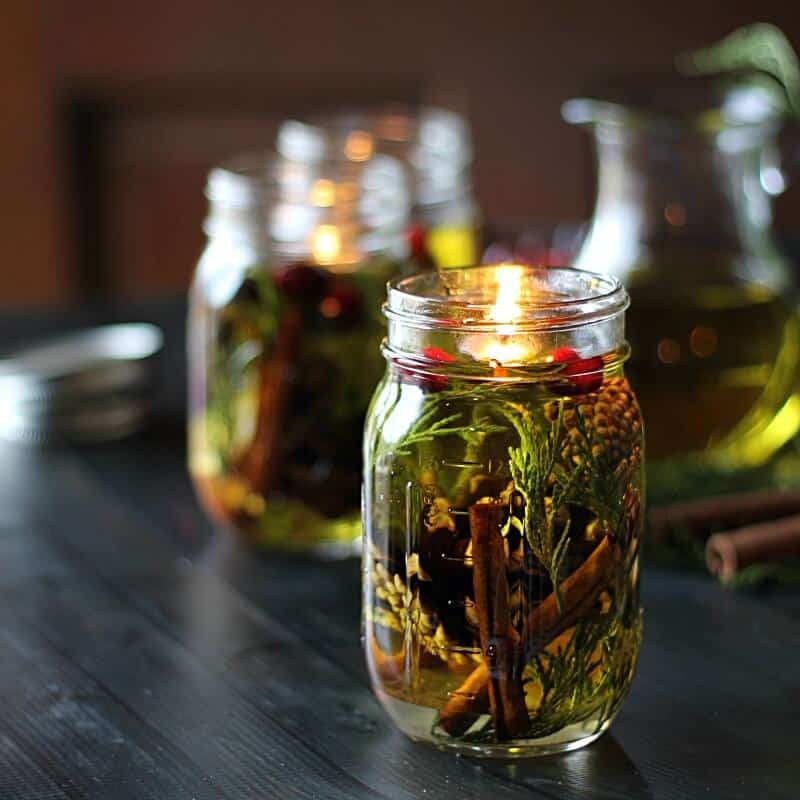 Freshen up this festive season with a homemade winter-themed air freshener. You’ll need rosemary essential oil and spearmint essential oil, plus absorbent polymers (such as Watersorb) to soak that up. With Halloween, Thanksgiving, and Christmas all back-to-back at the year’s end, the holiday season can get pretty tiring and stressful, especially for moms. Show you understand with this fun and festive, and definitely much-appreciated, candy cane vodka gift. 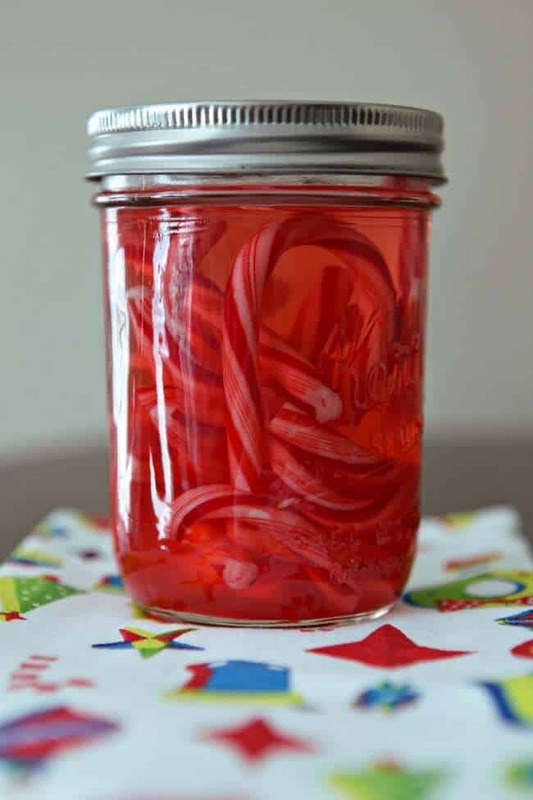 All you have to do is steep candy canes in a jarful of vodka until they dissolve, and that’s it. Perhaps simplicity is the key to brilliance after all. Slime has taken the children’s world by storm— whether your sticky countertops like it or not, as it would seem. 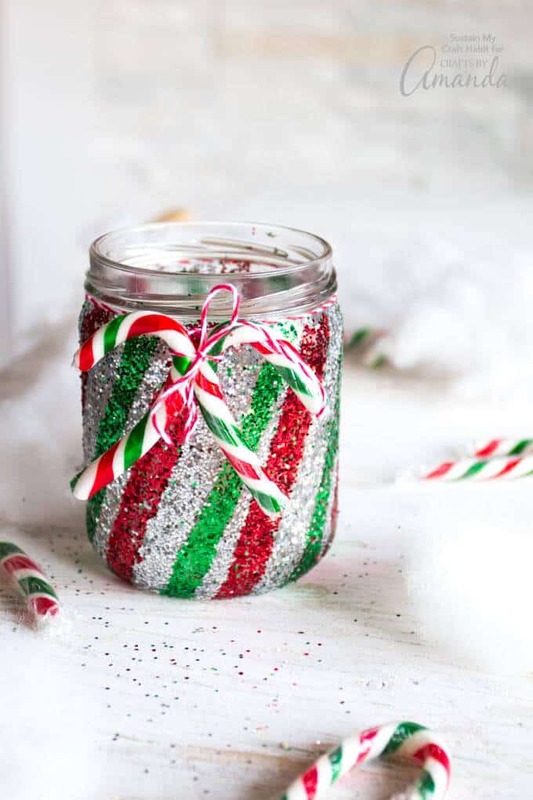 These Christmas-themed slime jars are the perfect holiday twist on the kid’s craze. You’ll need the usual mix of elmer’s glue, baking soda, and contact lens solution. Using food coloring, make it green for a Grinch, brown for Rudolph, and leave it uncolored for a snowman. Pack the goo into their respective jars, and draw on the faces with sharpie, adding googly eyes, pom-poms, felt, and other accessories, where necessary. It can get chilly in the next few months, so crochet up some cozies to keep your mason jars warm. Well, to keep them cute a lot more than warm, but you can’t deny how neat this Claus-themed cozy looks. This project does require some technical knowledge, but it’s still relatively easy as a crocheting project. So pick up your crochet hooks and yarn needles, and get started! 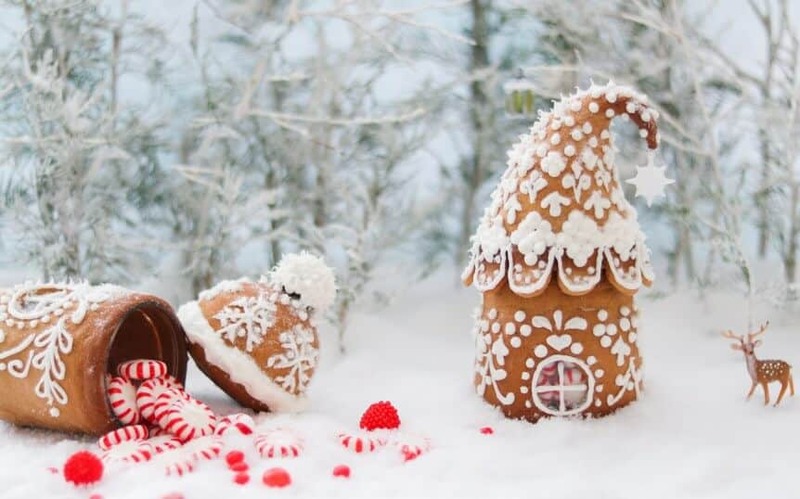 Gingerbread houses can seem like one of those Christmas fantasies– beautifully festive, but certainly way too hard to craft, you may think. But if you’re willing to scale down, that fantasy can be a reality, and a mason jar is the perfect base to build it around. What’s more, this recipe uses real gingerbread dough, so feel free to gobble it up once you’ve taken some stunning photographs of it. You’ll also need a few tools, like a rolling pin and decorating tips, to frost and sculpt your gingerbread house. The sweet yet tart notes of this berry tasty jam, is sure to be a hit with friends and family alike. All you need are strawberries, cranberries, sugar, and liquid fruit pectin. Pulse the fruits, pour that into a pot, add sugar, and bring it to a boil over medium-high heat. Let it boil for a minute, then remove the pot from heat, and add pectin. Mix it, let it cool for 5 minutes, then skim the top layer of foam off. 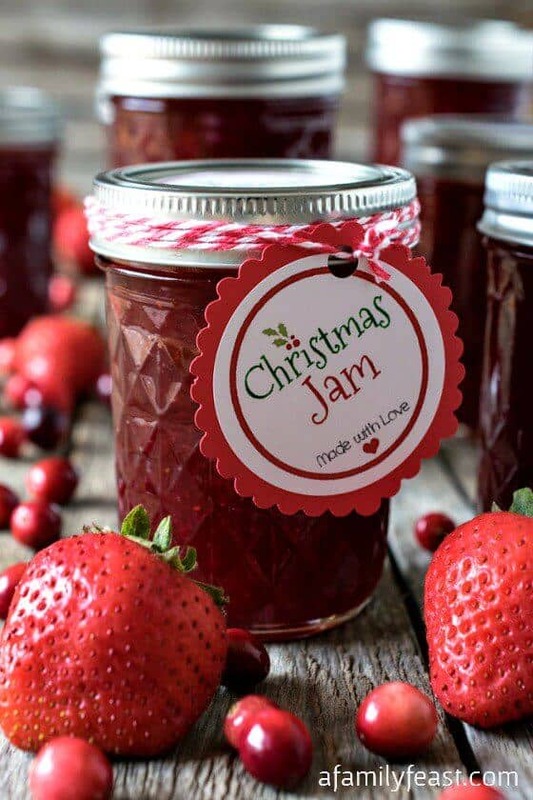 Ladle the jam into sterilized mason jars, then process it with a water bath, before gifting your homemade holiday jam. They’re out of the spotlight but not out of style– playdough is still perfectly giftable, and what’s more, this homemade playdough doubles as a Build-A-Gingerbread-Man kit to help along any young child’s fine motor skills. For the playdough, you’ll need flour, salt, cream of tartar, vegetable oil, spices, and water. 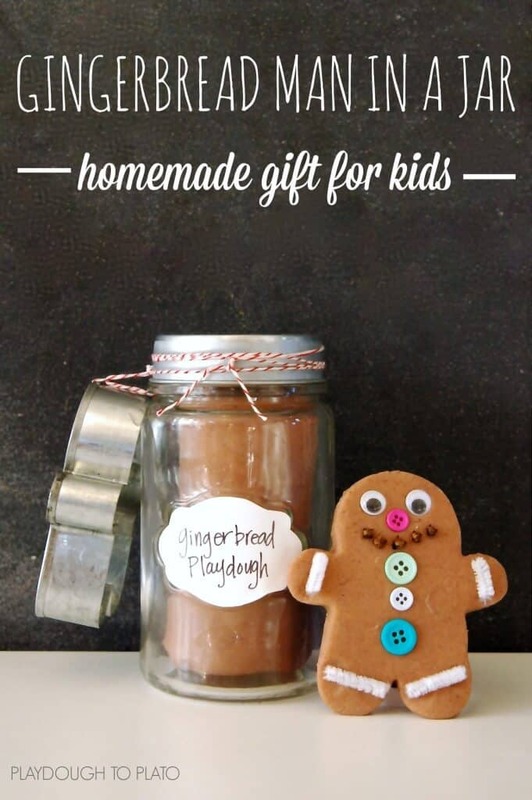 Pack that into a jar, and tie a gingerbread man cookie cutter to the jar. Gift it alongside baggies of gingerbread man parts, such as buttons and googly eyes. Coffee or Tea? With biscotti, it doesn’t matter which way you answer that question, because the biscuit goes great with either. So take a break from the usual fruity and spicy notes of Christmas desserts, and satisfy your guests’ sugar tooth with the chocolate and hazelnut notes of this biscotti. To create an easy-to-gift biscotti mix, just layer on hazelnut flour, baking powder, xanthan gum, salt, cocoa powder, sweetener, chopped hazelnuts, and chocolate chips, into a mason jar. Click below for detailed measurements, and the instructions your giftee will need to make biscotti from your mix. 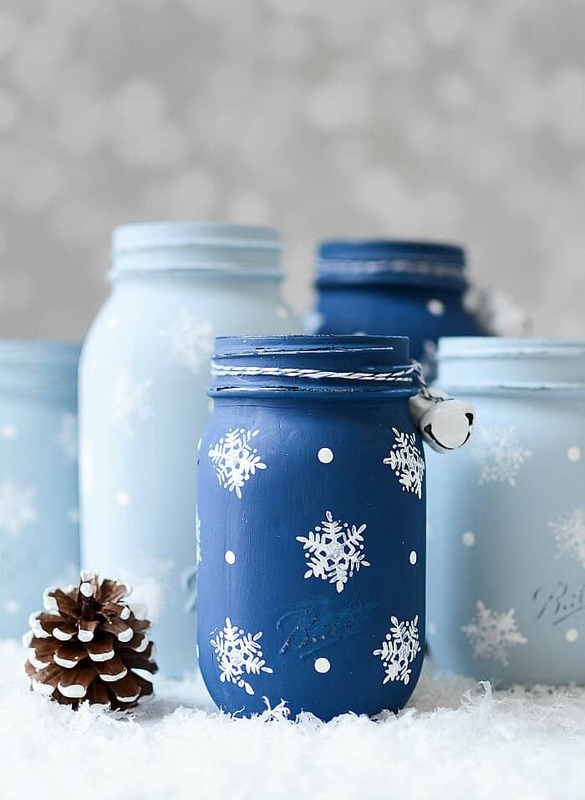 These simple but striking jars, in wintry shades of blue, get their beauty from the clean and sharp lines of the pristine-white snowflakes. But how do you accomplish that? Simple— with rubber stamps, which make a paint job look professional, even when you have beginner skills. 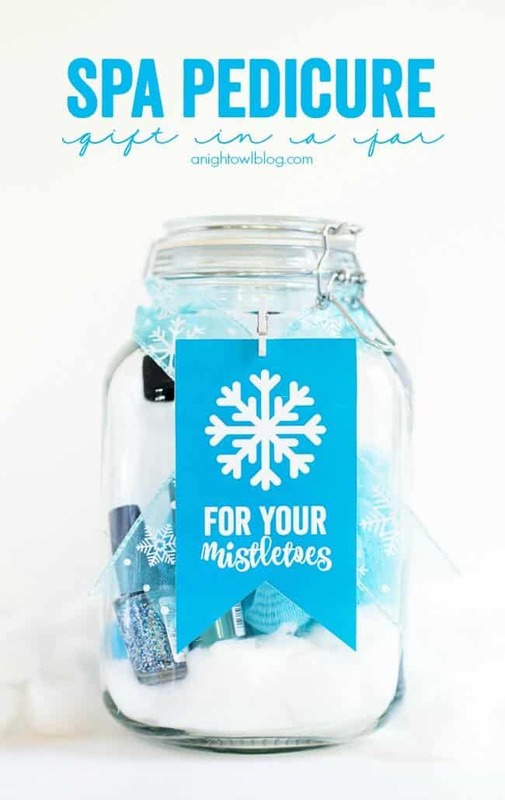 Just paint the jar blue, dip a snowflake rubber stamp in white paint, stamp it lightly on a paper plate to check it’s fully coated, then stamp it on the jar, rinse and repeat. Distress the jar, and add some white dots with a paintbrush, for an extra touch. Don’t blame me if you get mobbed by the little tykes for this one– it combines the two biggest trends in the kid’s world these few years: the movie Frozen, and of course a jar of slime. So grab some elmer’s glitter glue, borax, and water, and mix your way into your nieces’ and nephews’ hearts. 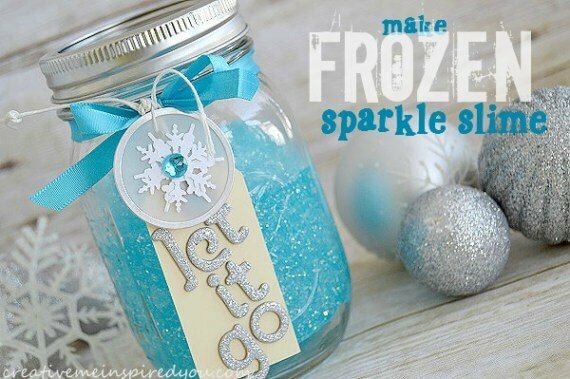 Add some Frozen-themed decor to the exterior of the jar, and you’re sure to become their favorite aunt. This easy-to-gift spa pedicure kit is all you need for your (mistle)toes. Go ahead and gift a pedicure-for-cheap to someone in your life this season. Items you may want to include in the mason jar, includes a foot file, a mesh bath sponge, nail polish, and polish remover. I personally also suggest a nail file, a nail clipper, and a cuticle pusher. Click below for more suggestions, and a free punny printable. 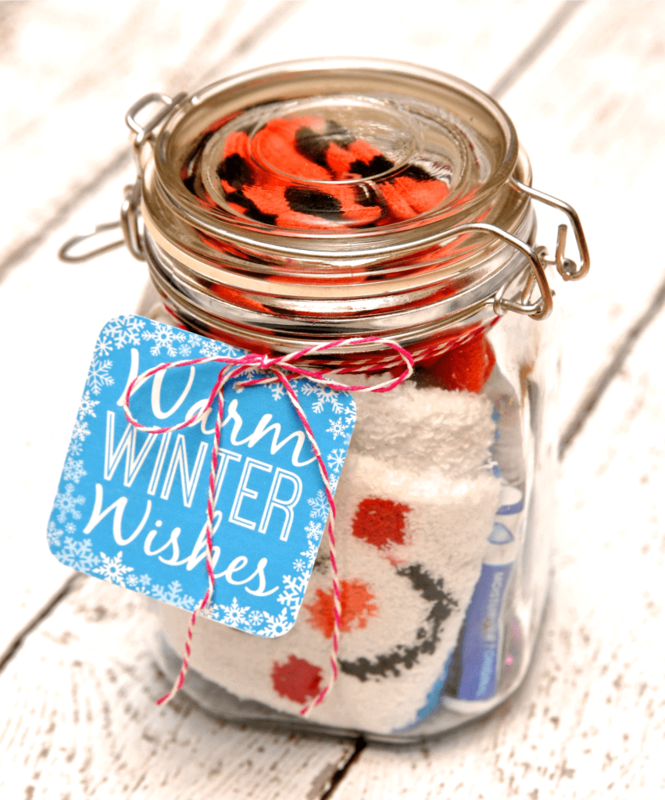 It’s the perfect package gift for frosty temperatures– a small but handy Winter Survival Kit. 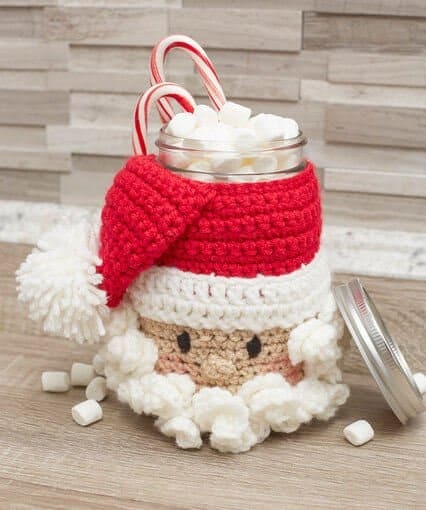 Items you may want to include in the mason jar, include cutesy snowmen socks, texting gloves (a brilliant way to keep warm while posting those Pinterest pins), hand lotion, hand sanitizer, chapstick, and hot cocoa mix (in fact, with all the mix suggestions we’ve given so far, why not make your own mix?). Chex Mix can be an addictive yet convenient cereal snack mix, but with ingredients that include “rye chips” and “breadsticks”, it surely doesn’t look that festive. So why not spend a little time adding adorable santa hats to the mix this season? Coat Bugles in melted red candy melts, and dip the base in white sprinkles. Spear mini marshmallows on the tips, and you’ve got some mini snack santa hats. 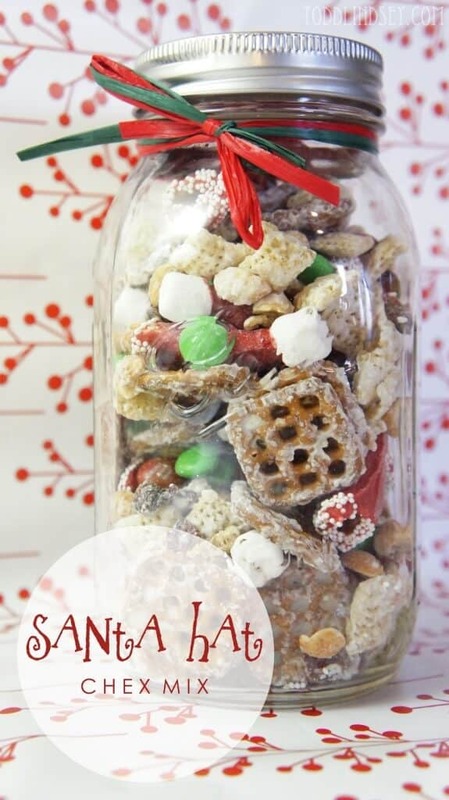 Click below for further instructions, including how to give your chex mix that wintry frosted look. P.S. Why not use Winter Cocoa Chex Mix to give it the ultimate holiday twist? Christmas Pudding is a timeless traditional food well-liked by many, though perhaps not by all. But this pudding mix yields a fluffier and lighter pudding, still spicy and fruity, so don’t be surprised if it converts quite a few pudding-haters. You’ll need fruits, brown sugar, ground almonds, self-raising flour, mixed spices and suet. Layer on the ingredients in that order, into a handy mason jar. 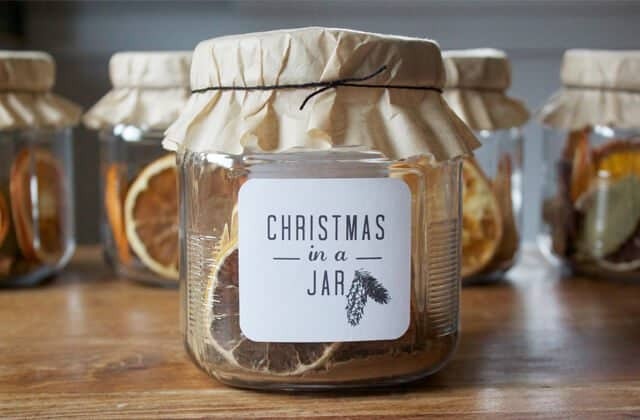 Decorate your mason jar, tie a wooden spoon to the jar, and be sure to include a label on how to use the mix to make Christmas pudding. Look I get it– it’s probably not that healthy, but it’s creamy, thick and sugary, and that’s why I myself can’t get enough of mousse. And hey, if you make a mini mason jar version, the small serving size kinda makes up for it, right? 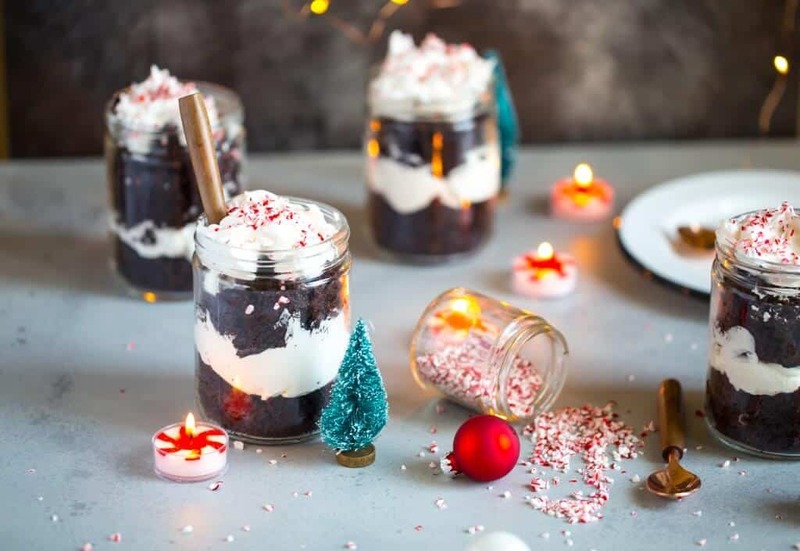 To make your chocolate mousse look truly tempting and festive, leave some space at the top of your jar to pour in fresh whipped cream, and sprinkle on candy cane pieces. 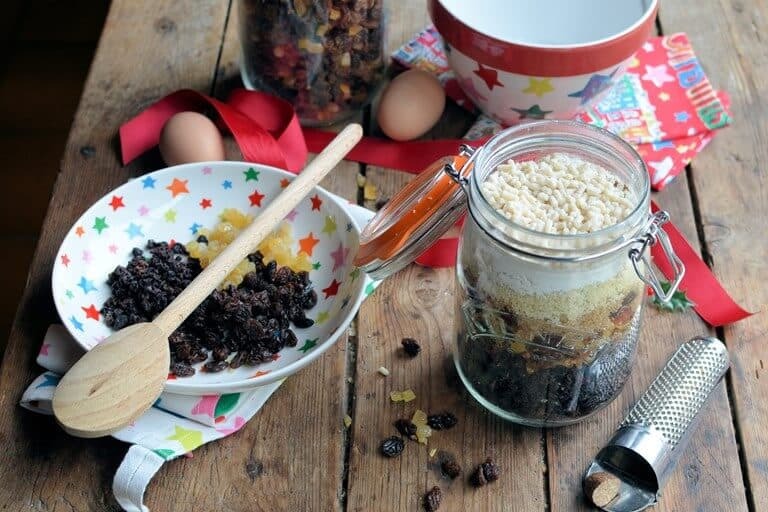 Don’t be fooled by the mere appearance of mincemeat, which may not look all that appetising– it’s a labor of love best started a whole year in advance, but it’s well-worth that foreplan. Mix together fruits, sugar, lemon rind, and melted butter. Add spices, brandy and Grand Marnier, mix, cover it, and wait 24 hours. The next day, mix it again, and leave for another 24 hours. Finally, stir well and pack into a mason jar (you might want to process it with a water bath, to make it extra airtight), and place it in the refrigerator for 6 months. Not everyone can be home for Christmas– if you want to gift some homemade cookies to a long distance friend or relation, and you are afraid they will go stale in shipping, cookie mix may be the next best thing. This project involves layering all the ingredients one would need for cookie dough, and it even involves a layer of rainbow M&Ms to catch the eye. For detailed instructions, and free printables which includes a nifty label of making-and-baking instructions for your giftee, click below. 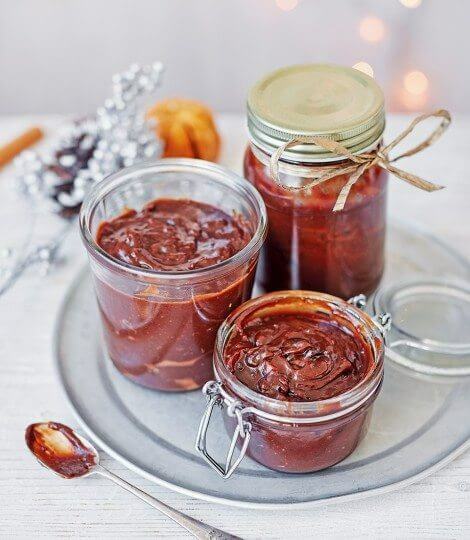 It’s caramel sauce– no wait, it’s chocolate caramel sauce– no wait, it’s salted chocolate caramel sauce with Christmas Pudding flavors, the ultimate holiday twist on the simple sweet substance. You’ll need salted butter, sea salt, spices, sugar, orange zest, double cream, an alcoholic drink, dark chocolate, and finally, some crumbled Christmas pudding. 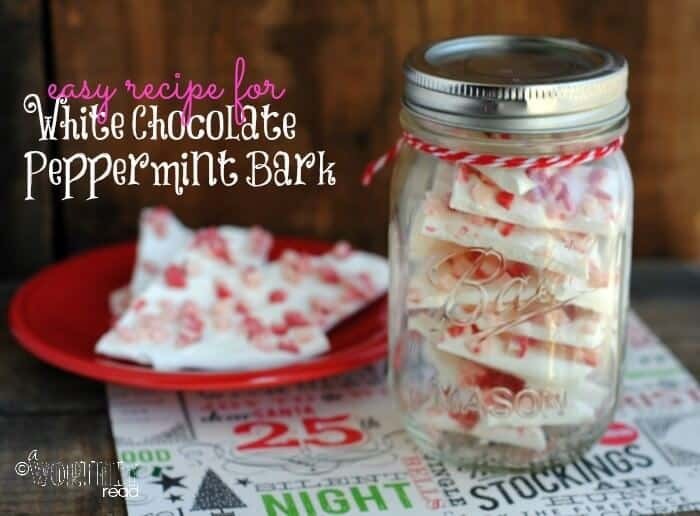 Peppermint and chocolate really do go together well, like a ski trip and a cup of hot cocoa. 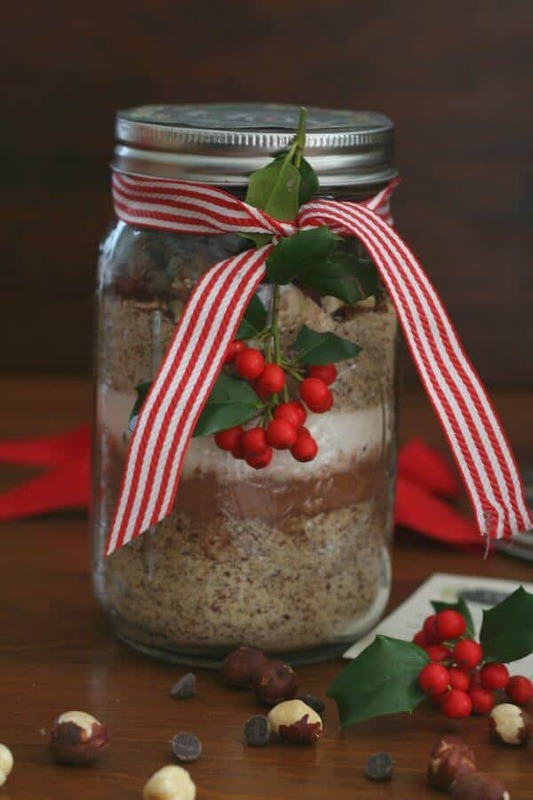 Make a decadent trifle version of this classic Christmas combination of flavors, in easy-to-gift mason jars. The moist and minty chocolate peppermint cake layers contrast well with the cool and light whipped cream layers. Top it off with festive-red crushed peppermint pieces to really make your gift turn heads. Soaking in a warm bath full of scented salts is such a relaxing experience, it’s the perfect way to treat yourself between pricey spa treatments. 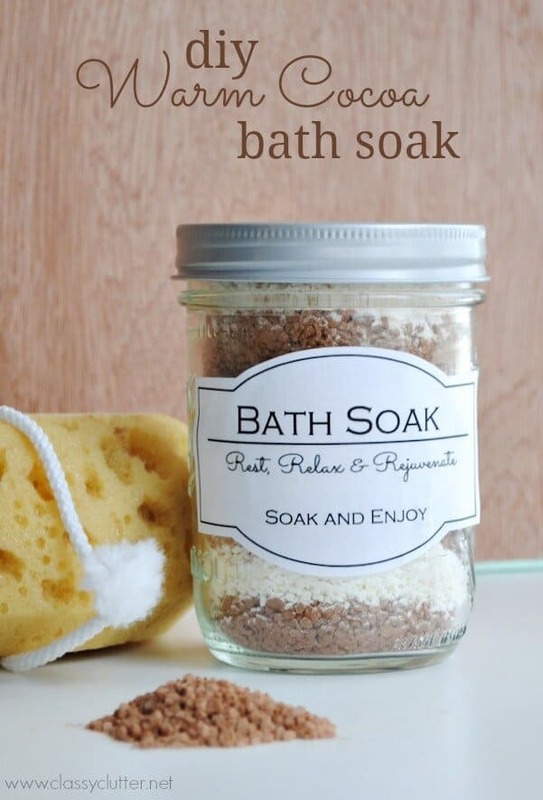 For this gift of a bath soak mix, you’ll need to make cocoa bath salts, and creamy milk bath soak mix, packing them into your mason jar in alternate layers. The ingredients you need are surprisingly simple- epsom salt, coarse sea salt, unsweetened cocoa powder, powdered milk, cornstarch, and baking soda. So soften your skin and let it drink warm cocoa too this season. You’ll have to keep this craft cool, and it’s best served soon, but it’s sure to wow guests with how quirky it is. 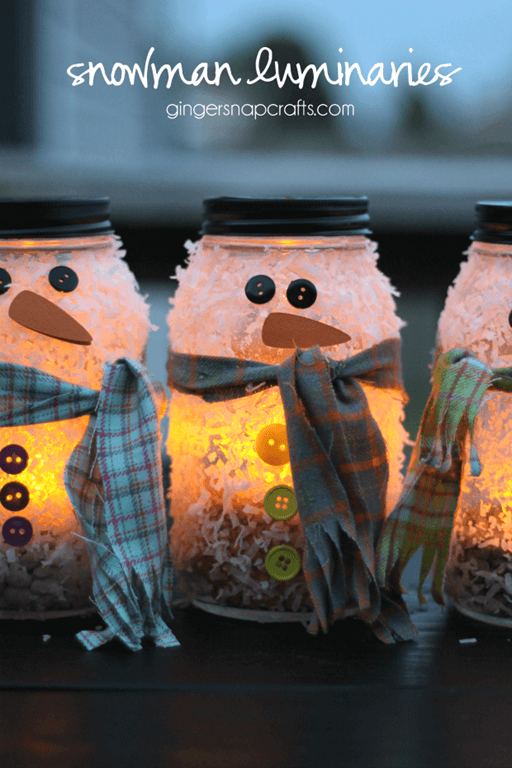 These jars are topped with snowman heads made from white yarn and felt, to really catch the eye. 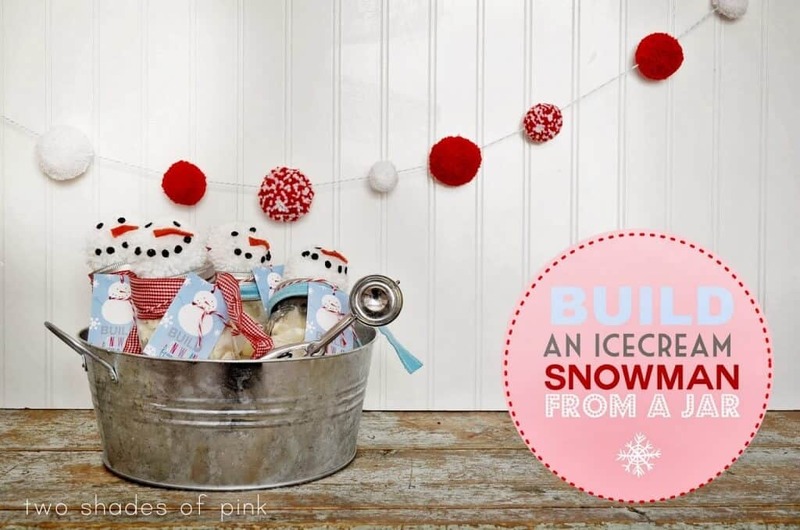 Fill the mason jar with vanilla ice cream, add scarves to the jars to keep your snowmen comfy, include baggies of snowman parts on the side, and toss these gifts into an ice bucket to keep them chill. All the kiddos have to do, is build a snowman from that, especially before the ice cream they’ve taken out melts. Myrrh, frankincense, and gold– if we could make a sugar scrub with those three ingredients, it’d be the ultimate Christmas sugar scrub gift. 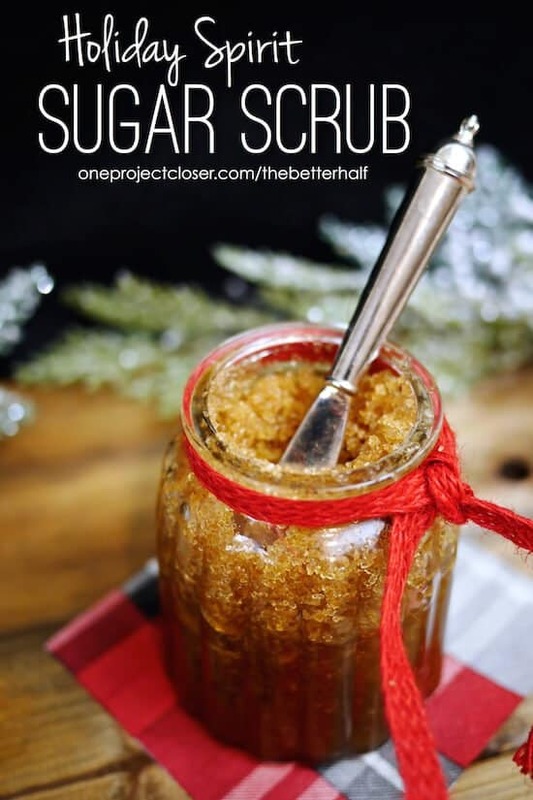 But this golden sugar scrub made with frankincense essential oil, may be the closest thing. Sugar scrubs are the perfect go-to craft for the time-pressed mom– it’s always a useful gift great for exfoliating, plus you can make it quickly with few ingredients and for cheap. This scrub requires olive oil, Christmas Spirit essential oil, Orange essential oil, Frankincense essential oil, and of course, sugar. We’ve told you before about the pluses of a salt bath– so here’s a whimsical and festive twist on easy-to-gift bath salts. The bright red and white contrast of the layers is just like a candy cane’s, and the mild but minty scent of the resulting bath fits right in with that theme. You’ll just need Epsom salt, spearmint essential oil, and eucalyptus essential oil. Have two bowls- one for the white layers, which are left uncolored, and another for the red layers, where you add red food coloring. Layer it up in a mason jar, and you’ve got yourself quite the playful-looking bath salt gift. This luminary is beautifully atmospheric– reminiscent of a cobblestone alleyway on Christmas night, all the way back in Victorian times. 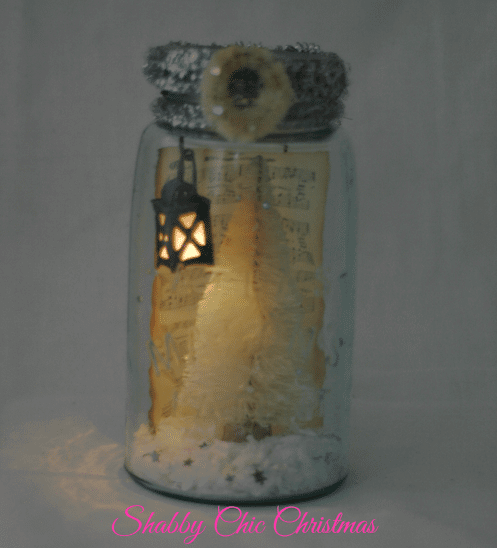 You’ll need a miniature vintage lantern to light up the jar, a cut-up music sheet on yellowed paper (you can always yellow fresh paper yourself), a miniature christmas tree ornament brushed with mod podge to really make it sparkle, and faux snow. The set-up is surprisingly easy. The holiday season can get pretty hectic—squeezing through the shopping crowds, baking tray upon tray of festive goodies, and so on. 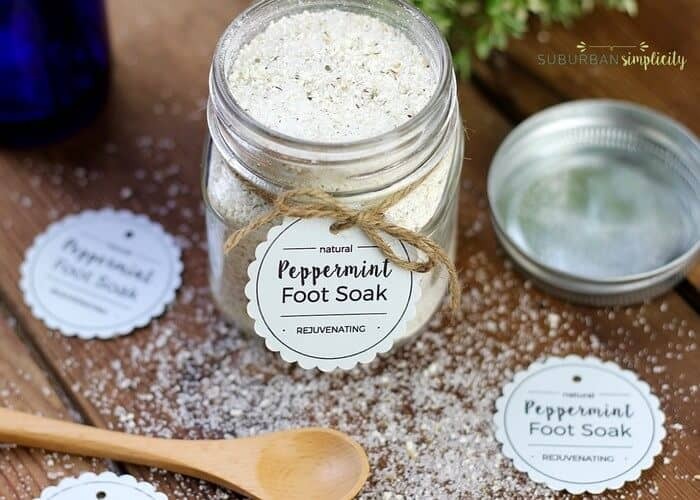 So rest your tired feet and leave them feeling brand new, with a minty festive foot soak. This easy and inexpensive soak requires only powdered milk,epsom salt, and peppermint tea (or peppermint essential oil). Mix those well, and pack it into the mason jar– it’s also the perfect last-minute gift. Not sure what to gift to a distant relation? Squeezed for time and starting to panic? The humble gift card can never go wrong. But show your sincerity by prettying it up in this creative craft. Get two mason jars of specified sizes. 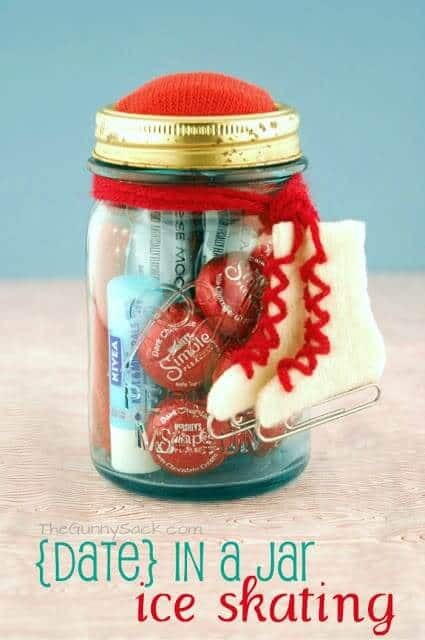 Glue the jar lid rings together, fill the small jar with festive candy, cover with lid, and attach one side of the lid ring set. 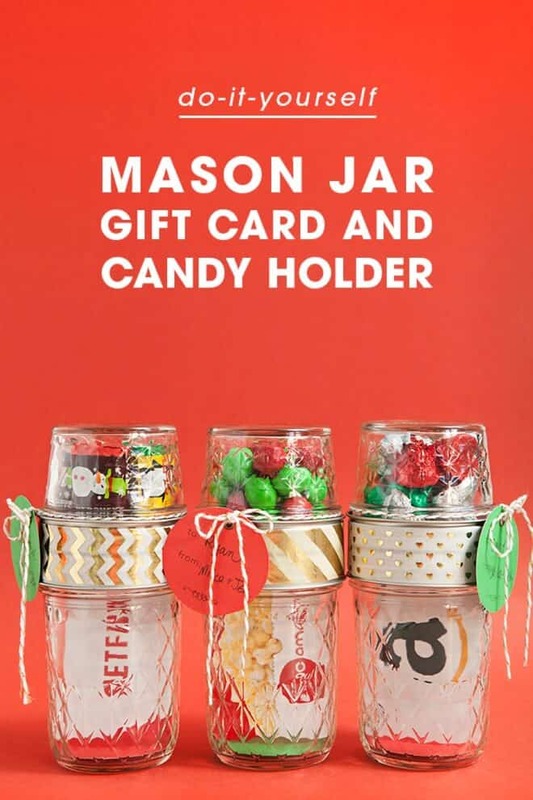 Place your cardstock, then gift card, into the large jar, cover with lid, and attach the other side of the lid ring set, to screw the two jars together. Finally, add some decorative tape to really make the colors pop. These powdered white chocolate truffles resemble small, yummy snowballs, so they’re a great fit for the Christmas season. What’s more, it’s an easy 3-minute 3-ingredient craft. Whip up some cream cheese, and slowly mix in melted white chocolate. Put that in a pan, and let it chill for a few hours in the fridge. Spoon it out, dip in powdered sugar, and roll em till they’re snowball round. 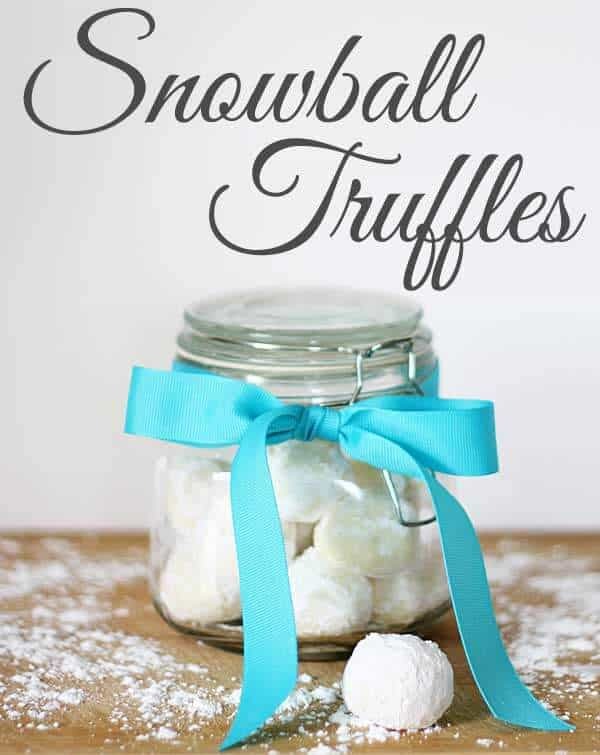 Pack your truffles into a mason jar, and add a pretty bow to tie it together. Still not quite over Thanksgiving? Add some pumpkin puree to your eggnog for the best of both worlds. 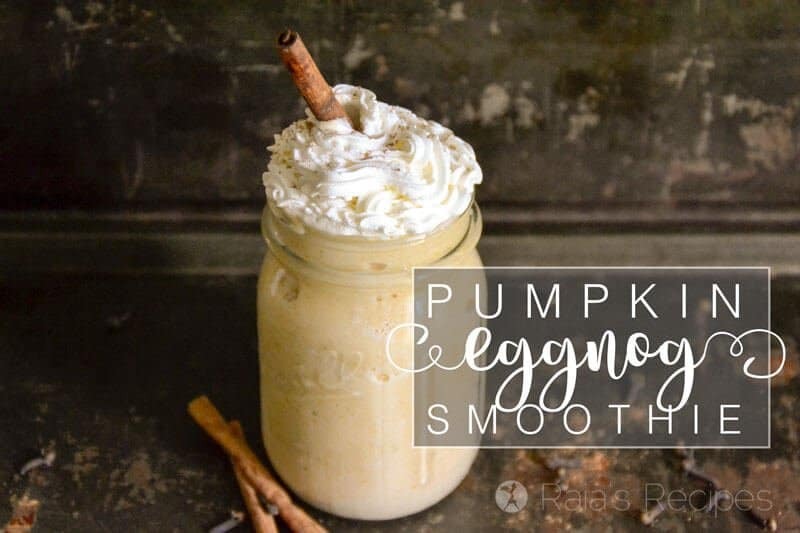 What’s more, this pumpkin eggnog smoothie has a dairy-free option, which makes it a great gift for the lactose-intolerant. Simply blend together whole milk (or coconut milk), egg yolks, gelatin, pumpkin puree, rum, honey, cinnamon, nutmeg, cloves and ice. Pour that into a mason jar for easy gifting. Or forego the lid to add whipped cream and a sprinkle of nutmeg, to make it utterly indulgent as a dessert drink for Christmas night. We hope that somewhere along this long list of mason jar crafts, you’ve found something that strikes your fancy. Whether you’re celebrating Hanukkah, Yule, Kwanzaa, or Christmas, the holiday season is a time of devotion and celebration– of the family, of the hearth, and of spirituality. Those in your life are sure to treasure your homemade gifts as labors of love, but don’t forget to take a little time off the rolling pin and the hot glue gun, to cherish what is truly valuable about this festive season.